Lisbon is opened for tourism. You can find a guesthouse or a hotel where sleep anywhere, and prizes are reasonable since 20€ per person. Firstly we were to rent a room in the old city (Baixa), but later we thougth that this area could be lugubrious at night. So we rented a room in a more residential neighbourhood called Saldanha, that is perfectly connected by subway. Taking the blue line or the green one we were in the center in ten minutes time. In the night these streets are more illuminated. Those who live in a big city know perfectly that subway is the more quickly and comfortable mean of public transportation. And those who unknow it, here they have another one attraction. Thus, there are trams and buses going up and down. Anyway, travelling by bus is more complicated if you don't know downtown. Among the trams you can find modern and old ones. 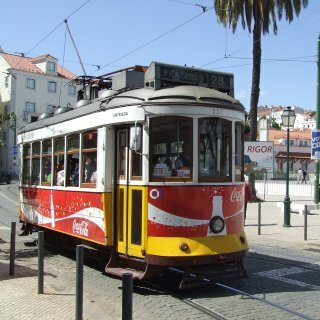 These are always going up and down to the most turistic places of Lisbon. As you go out of the Baixa-Chiado station you can see the Fernando Pessoa estatue next to a café, and the beautiful Camoes Square. 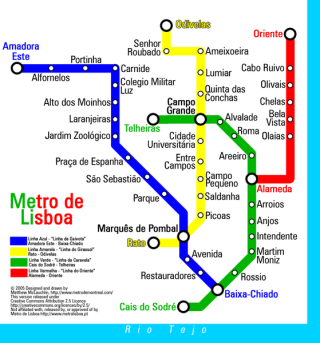 The metro station of de Baixo-Chiado has got an exit toward the Baixa and other exit toward the Chiado and Camoes Square. This way out has got a four levels escalator. It's similar to a taircase to heaven! Be careful when leaving the station, because if you take the wrong way, you will have to walk up the street or take a tram to go to the top of the hill. Eating schedule. In some places at 22:00 there are hardly a restaurant opened. In Saldanha neighbourhood all the places were closed. We only found openned a wifi café. If you come from a place like Spain where you can find restaurants and cafés open till lat in the night, this is surprinsing. Our first night we didn't have dinner because we waited a lot to get in a restaurant, so once we had choosen one, this was closing. Prices: They are not expensive, you can have lunch for 10€ per person. But be careful: while you are waiting they serve you bread, cheese and butter and also some black olives. In some places this is really expensive for tourists, they charge a lot here and in your drinks. So the best is to eat in places with menu, so you know how much everything will cost. Anyway, you always can say the waiter that you don't desire appetizer, that will be enogh. The coffees: There are a great variety of them. The "café" i black and half a cup. The "café cortado" is the same with some drops of milk. The most usual coffee is the "meio de leite", a coffee with half milk and halfcoffee in a medium-sized cup. leche a mitad y mitad, en una taza mediana. As curiosity: Most of cafés are "pastalerías" where you can have really good cake, biscuits and croissant with yous coffee.